I have been using synergy for years and from time to time i have problems. I have uninstalled and reinstalled synergy on both machines. Both machines are running the same version of Windows with the same updates. 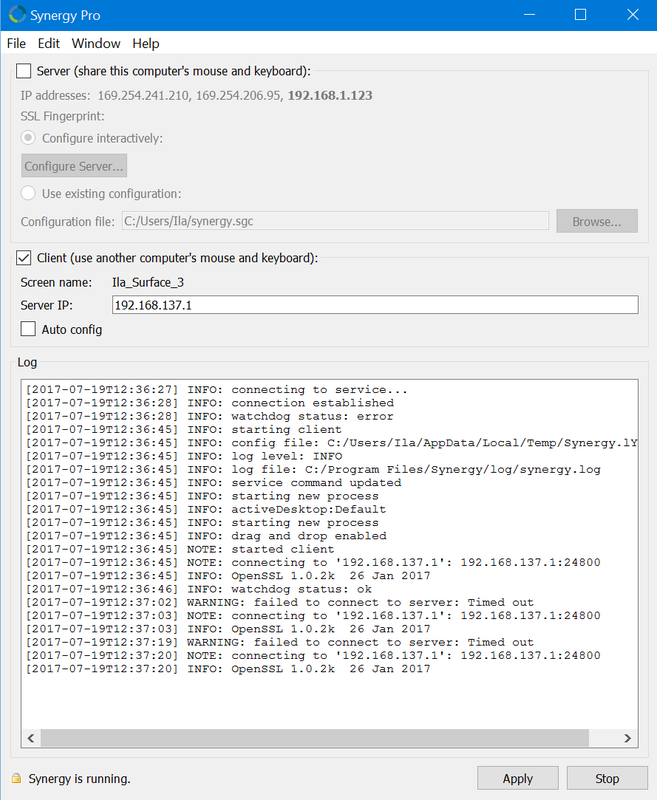 Both Synergy implementations are set with SSL but they will not connect. Hi @Ila Jehl. 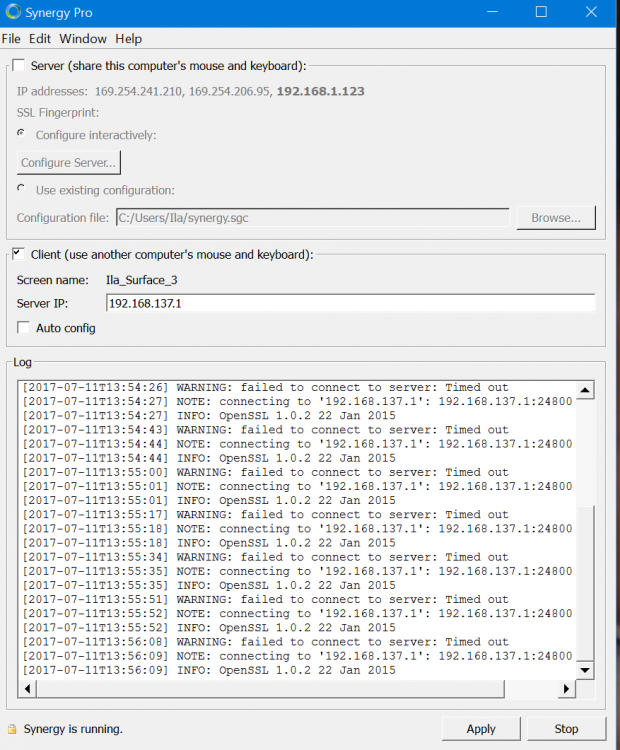 Can you post the logs on your client machine to show the actual failed to connect error? also, i have now attempted to change reverse the server and client... no love there either. I haven't heard anything further. Could you let me know if you have a solution? BTW I have also looked at other's with the same issue and have attempted many of the solutions with no luck. Sorry for the late reply on this @Ila Jehl. Please post a screenshot of both machine's Synergy interface and the Server Configuration interface on your server machine. Here are the latest. Thanks for the help and please lmk if you need more information. Can you try to double check the spelling of the server's screen name on your server configuration interface if doesn't have a space on it? I checked. no spaces. Again, it worked until it didn't, and I had not made any changes when it stopped. Thank you for that information @Ila Jehl. Please provide more details about your machines (OS, 32/64 bit, Synergy version installed, connected to the network via Ethernet or Wi-Fi, specify which one is the server). Please try using v1.9.rc3. You can get it from the forums thread tagged below. Please uninstall the current version first and reboot before installing it. Sorry to hear that it continues to have connection problems @Ila Jehl. Please post another set of screenshots of all of your machine's Synergy interface and the Server Configuration interface on your server machine. apologies, i thought I included these the other day. Hi @Ila Jehl. Please do this on your server machine. On Synergy's user interface, Click Stop and click Edit on top left. On your client machine, change the Server IP address to the address to 192.168.1.73 as well (since it's your server's IP address). seems to be working for now. Thank you Paul. That's great @Ila Jehl! Thanks for updating us too. Getting really frustrated. The home router changed but my computers have not. settings are all still the same but am not able to connect. (also note that I Selected stop on the interface but that didn't work so it is continuously trying to connect.